Let the games begin! Or the multitasking, or the video editing or the coding -- heck, anything you want to do, the Alienware 17 can handle with aplomb. For $3,974, you get a system that doles out ridiculous frame rates, a beautiful display, awesome audio system and Tobii Eye tracking. The laptop's also not too shabby on the multitasking front, thanks to its overclockable 8th Gen Intel processor, which you should definitely overclock, because the app is supereasy to use. The Alienware 17 R5 oesn’t reinvent the wheel but it does live up the brand’s legacy in all the right ways. The Alienware 17 R5 lived up to our expectations. Performance-wise you can’t get much better. Maybe the AMD Ryzen 7 2700 can beat the Core i9-8950HK in some benchmarks but real-world performance shouldn’t be any different. And as far as GPU performance goes, the GTX 1080 is the best on the market for now. We are waiting for NVIDIA’s new GPUs which should release soon judging by all the rumors. The Alienware 17 R5 is a slickly designed gaming laptop that leverages Intel's first Core i9 mobile chip and an overclocked GeForce GTX 1080 to deliver desktop-class power. It's heavy and expensive though. Refinement or raw power: Pick your poison. Regardless of which you choose, Core i9’s arrival means that mobile laptops can finally rival top-tier tower PCs in performance. The Alienware 17 R5 heralds an exciting future. “Desktop replacements,” indeed. The new Alienware 17 R5 delivers excellent gaming power in a sleeker, hinge-forward design with captivating sound and lighting effects. Model: Alienware has updated its 17-inch gaming laptop with Intel i9 processors. The new hexa-core Coffee Lake chips are supposed to bring desktop-class processing power to laptops. This variant features a factory overclocked Nvidia GTX 1080, QHD (2,560 x 1,440) 120Hz G-Sync display, and an integrated Tobii Eye tracking module. 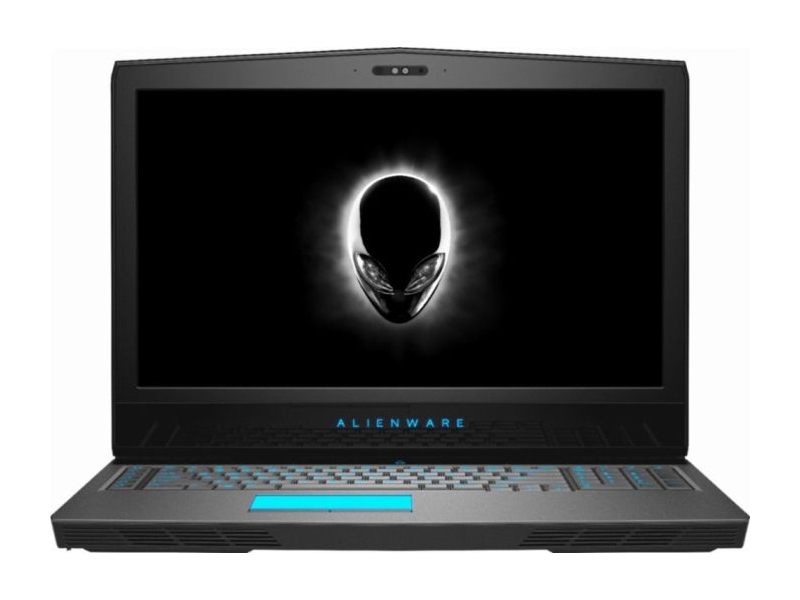 In 2018, the new Alienware 17 R5 uses the same chassis as the 2016 model. It still sticks to the hinge forward design. Dell specifies a size of 424 x 332 x 29.9 mm (16.7 x 13.1 x 1.181 inch) and an average weight of 4.42 kg (9.74 lbs). Hence, size and weight remained unchanged when compared to last year’s R4 model. www.techradar.com complains, “Its nearly 10-pound weight will wear you out and its square-shaped proportions makes it awkward to find a suitable laptop bag.”. www.tomshardware.com finds, “While this model retains the same basic shape as versions from previous years with aggressive angles and a spaceship theme, the laptop’s aluminum frame is all-black, giving it a serious aesthetic that means business.”. They report that the deck surrounding the keyboard is covered in a soft-touch material that feels luxurious to lay your wrists on, but wished the keyboard were slightly further forward. www.digitaltrends.com finds the thick bezels around its display look dated compared to smaller, slimmer offerings. The connectivity includes a RJ-45 Killer Networks e2500 Gigabit Ethernet port, two Type-A SuperSpeed USB 3.0 ports (one of them with PowerShare technology), a Type-C SuperSpeed USB 3.0 port, a Thunderbolt 3 port (USB Type-C with support for SuperSpeed USB 10Gbps, 40Gbps Thunderbolt, and DisplayPort), an Alienware Graphics Amplifier port, an HDMI 2.0 output, a Mini-Display Port 1.2 output, an audio out and a headphone port, and a Noble Lock port. In www.digitaltrends.com’s opinion the port selection is pretty standard. The Tobii eye-tracking feature is only available in high-res screen options. www.techradar.com finds the eye-tracking module most useful in Assassin’s Creed Syndicate. Apart von Tobii integration in games, there are some uses in Windows such as Windows Hello login and presence detection. However, Alienware’s standard webcam also delivers the same presence detection features. The Alienware 17 R5 features a 1080p webcam. According to www.laptopmag.com it takes some seriously sharp stills. For maintenance you just need to open the bottom access panel. Once done, you can swap out the SSD and RAM. The latest version of the Alienware Command Center allows customizing the R5’s lighting, performance, and power consumption settings. In www.digitaltrends.com’s opinion this software suite has an attractive UI and is utilitarian. The steel-reinforced TactX keyboard features 2.2 mm of key travel and 79 grams of actuation according to www.laptopmag.com. It supports n-key rollover. Its RGB/LED-enabled AlienFX lighting can be configured in 13 RGB lighting zones or optionally per key (+$30). www.techradar.com finds that its tactile responsiveness makes you forget about a mechanical gaming keyboard. www.tomshardware.com reports that the keyboard features nine programmable macro keys. The trackpad measures 10.16 x 5.33 cm (4 x 2.1 inch). It lights up when you touch it. www.laptopmag.com had no problems with the gestures they have tested and finds that the pair of discrete mouse buttons are nice and springy, and deliver a nice click when pressed. www.digitaltrends.com thinks the touchpad feels silky and smooth to the touch, but in an era of massive touchpads, it feels a bit small at times. There are three 17.3-inch display options for the GTX 1080 variant, which are FHD (1,920 x 1,080) 60 Hz IPS Anti-Glare 300-nits, QHD (2,560 x 1,440) 120 Hz TN+WVA AG 400-nits, UHD (3,840 x 2,160) 60 Hz IPS AG 300-nits. All display variants are Nvidia G-Sync enabled, but only the latter two feature Tobii IR eye-tracking. We will cover the QHD model here. www.techradar.com finds that the TN panel’s color depth and black levels are almost as good as an IPS monitor. www.digitaltrends.com says colors are bright and vibrant without being washed out or too heavily saturated and the contrast-ratio of 560:1 is not bad, but falls behind the Helios 500 and the Asus ROG Zephyrus. In www.laptopmag.com’s opinion, the matte anti-glare display delivers robust color and unrivaled brightness with generous viewing angles. They measured a brightness of 352 nits and 110 percent of the sRGB. According to www.tomshardware.com the measured average of 352 nits is far higher than their average (283 nits) as well as the Aorus (243 nits), Eon (252 nits) and Titan (257 nits). They summarize, “The 17.3-inch, 2560 x 1440 display on our review config is bright and beautiful.”. The Alienware R5 17 comes with an Intel Core i7-8750H processor combined with up to 32 GB of DDR4, 2,400 MHz and up to an Nvidia GeForce GTX 1080 OC with 8 GB of GDDR5X VRAM. We will cover the variant with over-clocked GTX 1080 and 32 GB of RAM here. Despite power-hungry hardware, it gets along with only one power brick, while for example the Asus ROG G703GI (same GPU and CPU) requires two power bricks, whereas the Alienware outperforms the Asus in all 3DMark tests in www.techradar.com’s tests. You can expect very high graphics performance and www.laptopmag.com confirms that the Alienware definitely delivered in their tests. www.tomshardware.com played several games and the frame rate exceeded their premium gaming average in all of them. The 2.9-GHz, 8th generation Intel Core i7-8750H can be overclocked to 5 GHz in the Alien Command Center. www.laptopmag.com ran Geekbench 4 and the laptop achieved a score of 20,890, which beats their premium gaming laptop average (17,290), but is lower than competing laptops with the same hardware. By means of the Alienware Command Center and CPU-Z and HWInfo, www.tomshardware.com observed that the internal temperature spikes and the processor often didn’t reach the 5 GHz the Alienware Command Center promised. www.digitaltrends.com thinks the 512GB SSD was relatively quick. In www.laptopmag.com’s opion, the system stays relatively cool when you're gaming or watching videos thanks to the Alienware Cryo-Tech v2.0 cooling system. The laptop’s keyboard hit ~36 °C (97 Fahrenheit) and the bottom reached ~49 °C (120 Fahrenheit) while www.tomshardware.com played Middle-earth: Shadow of War. To test sustained gaming performance, they ran the Metro: Last Light benchmark 10 times, which is roughly half an hour of high-stress computing. The frame rate dropped from 83.4 fps in the first run to 79.29 fps in the last run, the average frame rate being 79.3 fps and HWInfo reported an average CPU temperature of 88.9 degrees Celsius, and an average GPU temperature of 74.8 degrees Celsius. In www.techradar.com’s opinion the 2.1 stereo speakers are potent enough to overpower the system’s loud fans and give you a surprisingly booming gaming experience even without having to plug in a gaming headset. www.laptopmag.com experienced loud, crisp audio even with maxed out volume in the largest conference room in their office. www.tomshardware.com finds that even the bass were clear and well distributed. In www.techradar.com’s tests, their test unit achieved a longer battery life than their test sample of the predecessor. It lasted 3 hours and 40 minutes in their movie test, while the Asus ROG G703GI only achieved a battery life of 1 hour and 29 minutes. In www.laptopmag.com’s continuous web surfing over Wi-Fi test at 150 nits of brightness, the Alienware lasted 3 hours and 47 minutes and surpassed their 3:26 premium gaming laptop average and several competitors. Pros are high graphical performance and the QHD display. Despite high performance, the Alienware surprises with a decent battery life. On the downside, the device is heavy and Tobii eye-tracking is only available in models with high-resolution display. www.digitaltrends.com summarizes, “Taken as a whole, the Alienware 17 R5 delivers on everything it promises — exceptional gaming performance, unbelievable processing power, and a gorgeous display. ”. As of September 2018, Dell charges about $3,600 for the top specced model. The base model with GTX 1060 OC, 17.3 inch FHD (1920 x 1080) 60 Hz IPS anti-glare display, 8 GB of DDR4 RAM, and single 1 TB (+8 GB SSD) hybrid drive costs about $1,500. Alternatives include the MSI GT75 Titan, the Aorus X9, the OriginPC Eon 17-X, the Acer Predator Helios 500, and the Razer Blade or Razer Blade Pro. NVIDIA GeForce GTX 1080 (Laptop): Pascal based laptop graphics card using GDDR5 graphics memory. Should offer a similar performance to the deskto GTX 1080. However, there is also a more power efficient "Max-Q" version that performs worse than the normal GTX1080 and is used in thin and light laptops. These graphics cards are able to play the latest and most demanding games in high resolutions and full detail settings with enabled Anti-Aliasing. » Further information can be found in our Comparison of Mobile Graphics Cards and the corresponding Benchmark List. 8950HK: On Coffee Lake architecture based processor for big and heavy laptops. Integrates six processor cores clocked at 2.9- 4.8 GHz (4.3 GHz with 6 cores) that support HyperThreading. Manufactured in an improved 14nm process (14nm++). Offers an unlocked multiplier that allows overclocking of the CPU.» Further information can be found in our Comparison of Mobile Processsors.